What could be more beautiful, fresh and delicate flowers? What could be more refined and more beautiful bride? 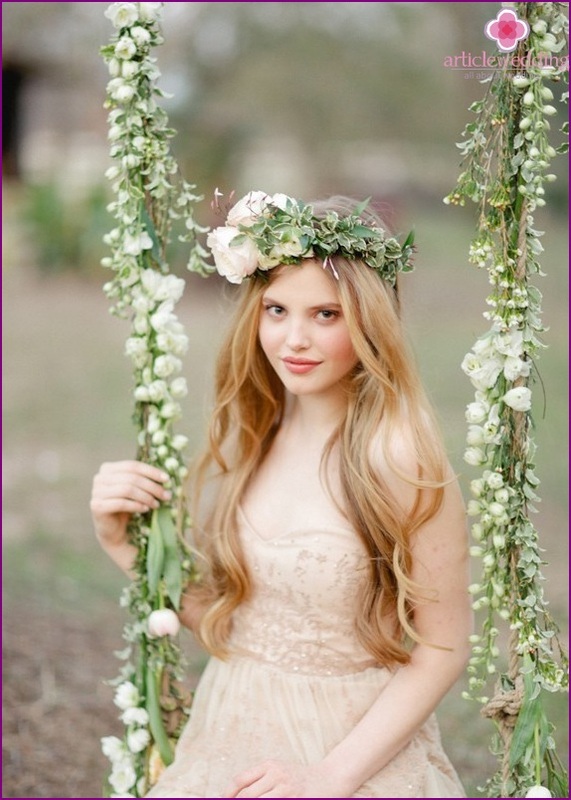 If you do not want to wear a veil or a hat, but you dream of gorgeous hair, stop the choice on bridal wreath. Arrangement of fresh flowers will add originality and tradition at the same time your bride along and make you truly irresistible. Wedding portal www.articlewedding.com shares the secrets of a successful choice of exquisite jewelry. 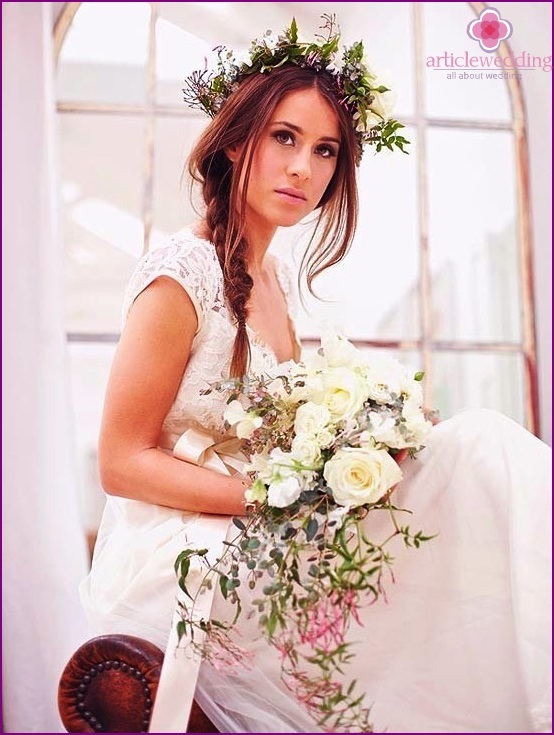 Bridal wreath is one of the varietieshairstyles with flowers. Stylists believe that such ornaments are suitable for young girls aged about 30 years. Then young colors perfectly complement the facial features. If your age exceeds this figure, the flowers may look unnatural and thus unlikely to add beauty to you. Everything is new - it is well forgotten old. So bridal wreath in ancient times was an indispensable attribute of the bride. Even in pagan times wreath is the link between man and nature. The heads of mythological characters are often adorned floral and herbal wreaths, such as Bacchus wore a wreath of vine leaves, Venus wove a wreath of red roses, their heads crowned with Greek music often ornaments of laurel and ivy. The ancient Greeks distinguished 20 kinds of wreaths tovarious special events. A wreath of red roses wreath called Hymen, god of marriage and family ties. It was a required element of a wedding dress as the bride and groom. Often added to roses orange flowers. In ancient Rome, we continued this tradition. The steel weave a wreath of myrtle and flowers. In Russia the tradition of decorating the head Suitewreaths and does not stop after the adoption of Christianity. The marriage wreath was considered a symbol of victory over earthly passions. It symbolizes the purity and innocence of the bride. However, the harsh climate are not allowed to use fresh flowers for wedding decorations the whole year. Gradually, in the autumn and winter began to make crowns made of wood, copper, iron, silver, gold, etc. In France, it was considered fashionable to weave wreathsBride of orange blossom. These ornaments were called orange blossom, that is, "Orange flower". Later they began to use wreaths and artificial flowers. Who is to weave a wreath? The unequivocal answer to this question is notexist. The bride and groom can weave wreaths to each other, and then share them. She can weave itself wreath itself, but at the end of the celebration wreath or embarks on the water, or is given, according to various embodiments, the husband or mother. This wedding ceremony symbolizes the loss of chastity girls after marriage. In Poland must weave a wreath friends and neighbors. In the Czech Republic it is the prerogative of the bridesmaids. As you can see, there is no clear limit, so you can trust in this matter, or an experienced florist to create a wreath itself. Traditionally, wreaths of flowers weave,symbolizing love and romance: red and white roses, lilies, myrtle, orange blossom, chamomile. Often used evergreens: rosemary, laurel, vine, root, boxwood, etc. In Russia, the wedding is often celebrated in the autumn, so the wreaths added wheat ears. As a talisman against the evil eye weave basil, garlic, hot pepper, red thread. As a pledge of prosperity and fertility - wheat, barley, coins, raisins, rings. Wreaths are often decorated with ribbons. Thus, in the preparation of the wedding wreath is necessary to consider the symbolism of colors. Wedding website www.articlewedding.com recommended to select both the bridal wreath and a bouquet for the establishment of a single style. 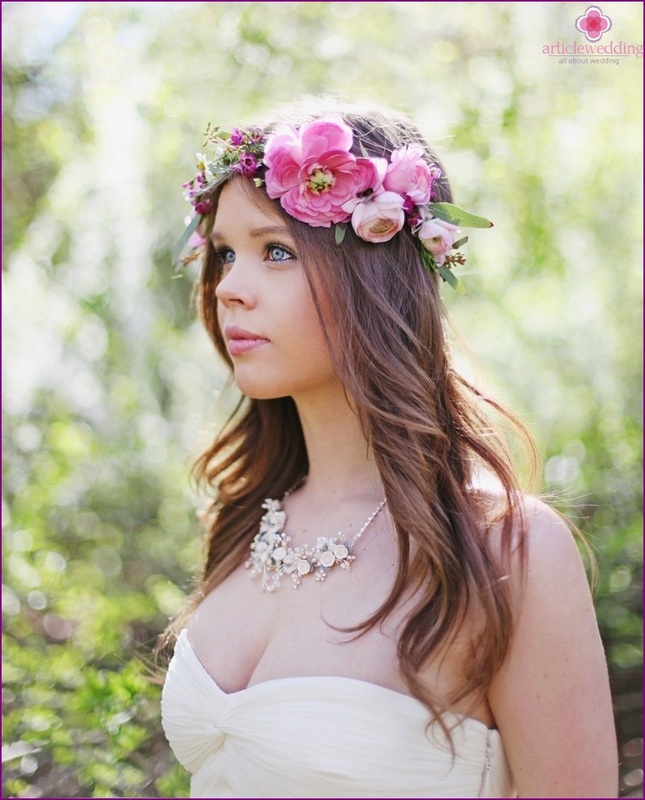 Bridal wreath is a great decoration forBrides with short hair. In this case, instead of fresh flowers, you can use an elegant jewelry. 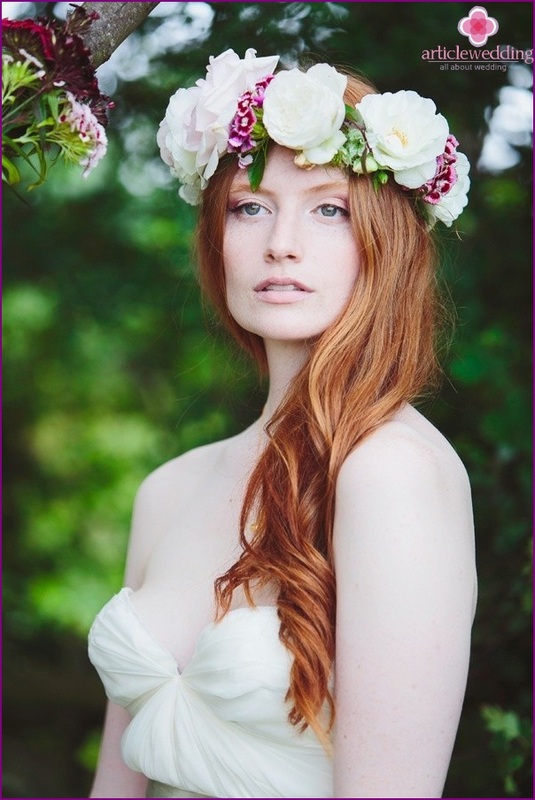 The wreath can be mounted or veils way to hide the seam between the hair and veil. 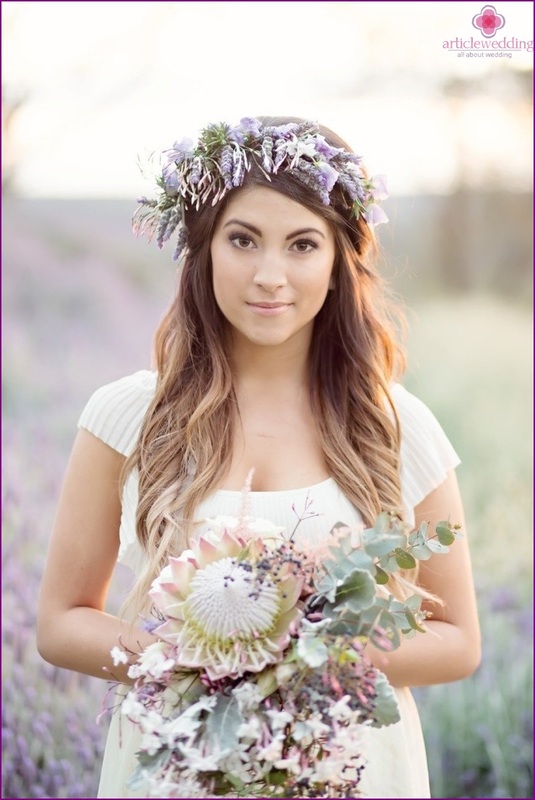 Girls with long hair can afford voluminous floral wreaths that will perfectly blend with soft curls or neatly combed wedding hairstyles. Bridal wreath should be disposed of. It should be stored and transmitted from generation to generation as a symbol of a happy family. 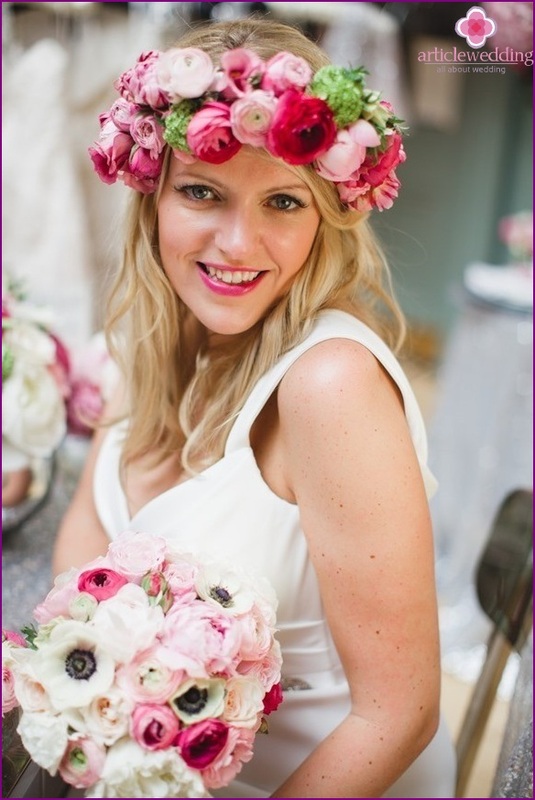 In ancient times the bridal wreath throwing bridesmaids in the same way as it is now do with a wedding bouquet. It is believed sewn into marital bed wreath brings warm relations in the pair. And if the colors do not fade for a long time, you can count on a large family. Today you can not because of the wedding wreathonly to distinguish an interesting hairstyle, but also to follow the traditions of our ancestors. Fresh flowers will complete hairstyle and romantic, and your image - graceful, gentle and sublime. Remember wreath Hymen - the symbol of prosperity and family happiness.